Instagram is all about the hook. If you want followers to stick around, you need to keep your content interesting and engaging. 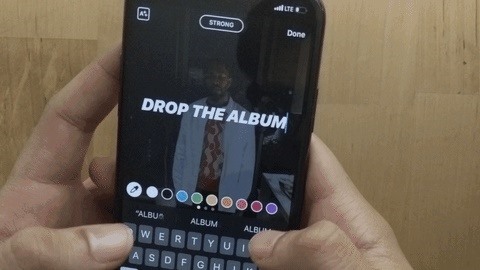 Rainbow text can really make your Stories pop, but it's not really an Instagram "feature," meaning it's not an easy task to accomplish. There is, however, an easy hack that takes all the work out of rainbow-colored text, making your Stories better overall. Instead of using a single boring color for on-screen words and phrases, rainbow text creates an ombre effect, giving each letter in your Story a different color shade. While a traditional rainbow would go from red to violet (or vice versa), you can start and stop with any color. It's not an option in Instagram's Story editor, but it's simple enough to go rainbow, no matter if you're using an iPhone or Android phone. With Instagram open, either swipe right or tap on the camera icon in the top-left corner to open the Stories camera. Then, take a picture or video, or select one from your library. Next, tap your finger on the screen to add text (any font) and write down whatever you want. Then, highlight the text you want to rainbow-ify. Now, using your right thumb, press and hold on a color on the right until the gradient tool appears. Sliding your thumb up will show lighter colors while sliding down will use darker ones. Keeping that thumb held down, take your left thumb, and hold down on the right edge of the selected text, making sure to grab that end cursor. Slowly slide both thumbs to the left at the same time and pace. You'll see the letters change colors as you go along. Confused? Don't worry. It took me a few tries before I got the hang of it. Check out the GIF below to see the process in action, which shows it off pretty well. Now, of course, you can use any page of colors you want (there are three different pages of colors on Instagram). Also, you don't have to start at the end of a gradient, you can start in the middle if you want. You could also start at the beginning so that your thumbs are moving inward toward each other instead. And you could take both thumbs left to right instead of right to left. It's pretty versatile. The only other way to create rainbow text is to highlight each letter separately, then color each accordingly, but that takes up way too much time. Although this two-thumb method is a bit tricky to perform at first, a little practice will make you an expert in no time. If you're on iOS though, be careful — once you jump back into the text editor, your rainbow text will be restored to a uniform color. On Android, your rainbow effect isn't removed just by opening the text editor, nor by typing more. Try to change the color, however, and that color will be applied to your entire text.